WinADay Casino is celebrating the release of their brand new slot Zodiac and you can join in the fun with a fantastic Winaday no deposit bonus. The Zodiac slot will debut at WinaDay casino with a $150 free chip and 200% match bonus. This new slots game is a 40 fixed payline title that comes with four exciting bonus features. These are based on Earth, Fire, Water, and Air, and will help players to get some amazing wins. The launch of this slots ties in with the casino's 8th birthday and there is a special WinADay casino bonus for all players. Three sun scatter symbols will payout an instant cash prize of 100 times your wager and activate a bonus feature too. The Zodiac slot also features a Wheel of Elements located above the reels and this wheel determines one of the four different bonus games that will be activated. The stars element determines a bonus of either Water or Air, and this triggers a Pick Me bonus game. During the Water pick me bonus game players have 10 chances to choose bet multipliers. In the Air bonus game there are less choices but multipliers go up to 10x which can lead to big payouts. If the Fire or Earth feature is selected on the Elements Wheel another bonus game is triggered and in this one players have the chance to win free spins and multipliers up to 20x. There is lots of action to be had and with four different bonus games players are guaranteed great entertainment and plenty of big wins too. WinADay casino manager Michael Hiliary has this to say about the new Zodiac slot. "The Elements wheel is really cool. You never know which bonus feature you will hit - your fate is in the stars. But with all the free spins and multipliers they all pay out well, so all horoscopes forecast good fortune." 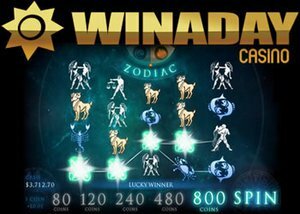 In order to celebrate the release of the Zodiac slots game and WinADay's 8th birthday, the casino is offering a fantastic promotion to all players. The WinADay no deposit bonus is $150 free chips and a 200% match on all deposits until the 3rd of July. In order to get your hands on these amazing offers, you will need to use a no deposit bonus code. To get your $150 free chip you need to use the no deposit bonus code: BDAYFREEBIE. To get a 200% match deposit on all your deposits you need to use the bonus code: ZODIAC. Remember these bonus offers are only available until the 3rd of July so be sure to take advantage of them while you can.